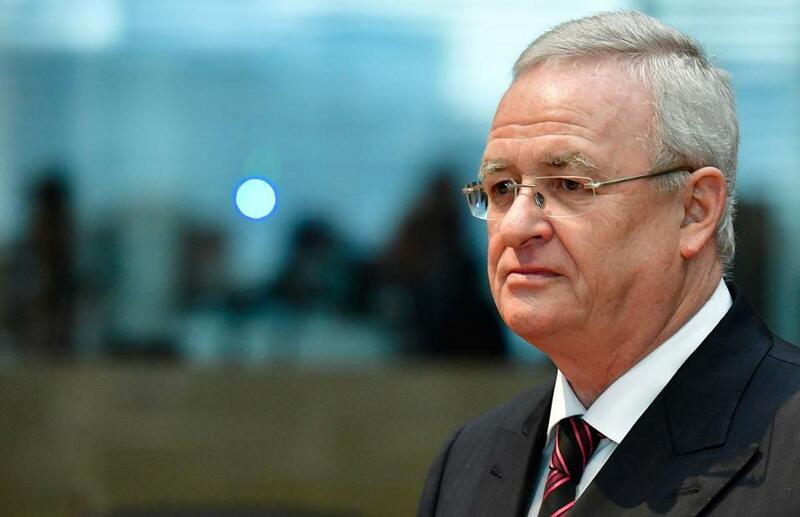 Former Volkswagen head Martin Winterkorn was charged with serious fraud in Germany for his role in the diesel-rigging scandal that rocked the carmaker and cost it about $33 billion. The former chief executive was accused alongside four other managers of equipping vehicles sold to customers in Europe and the United States with a so-called defeat device, authorities in Braunschweig said Monday in an e-mailed statement. Fraud charges carry a sentence of up to 10 years, and prosecutors also want to seize bonuses paid to the five men, which ranged from about $339,000 for some managers to about $12.43 million for Winterkorn. Allegations that VW wrongfully withheld information about the emission software used in its diesel cars have loomed over the company since the scandal first broke in 2015. The crisis involved up to 11 million diesel cars worldwide, and shattered the Wolfsburg-based company’s reputation. The 71-year-old former chief executive is also charged with breach of trust because of his failure to swiftly tell authorities about the devices, bringing higher fines for the company. Josef Ackermann, when he was chief executive of Deutsche Bank, was tried in 2004 in relation to his role in the Vodafone Group takeover of Mannesmann. The case was settled after an initial acquittal was overturned on appeal. About a decade later, Ackermann was on trial again, this time alongside then co-chief executive Juergen Fitschen over the collapse of the Kirch media company. Both were acquitted. Wendelin Wiedeking, the former Porsche head who was tried for market manipulation over a failed bid to acquire VW, also won his case. Winterkorn’s fate may soon be shared by former Audi chief executive Rupert Stadler, who is being investigated by Munich prosecutors who kept him in detention for four months. VW’s US shares rose 1.02 percent, to $17.86. VW itself settled with Braunschweig prosecutors in June, paying a fine of $1.13 billion. The company can’t comment on the cases of the individuals being charged now, VW spokesman Nicolai Laude said in an e-mail. The five are the first to be charged in Germany over the rigging. Prosecutors didn’t identify the four other executives. Winterkorn and other company leaders were indicted in the United States in 2017. The Braunschweig Regional Court now has to decide whether the charges will go to trial. The judges will review the 692-page long indictment as well as 75,000 pages of files, according to the statement. The probe against additional 36 suspects continues. While the actions of some of the men dates to 2006, Winterkorn was informed about the scam in May 2014, according to prosecutors. Six months later, he condoned a ‘‘useless’’ update of the vehicles’ computer software to help further veil the scam.